2 Israeli emergency medical volunteers finish training course - and deliver a baby on their very first day. Last week on Wednesday in Modi’in, 21 new EMTs graduated their training course and began volunteering as EMS responders in the city and surrounding area. 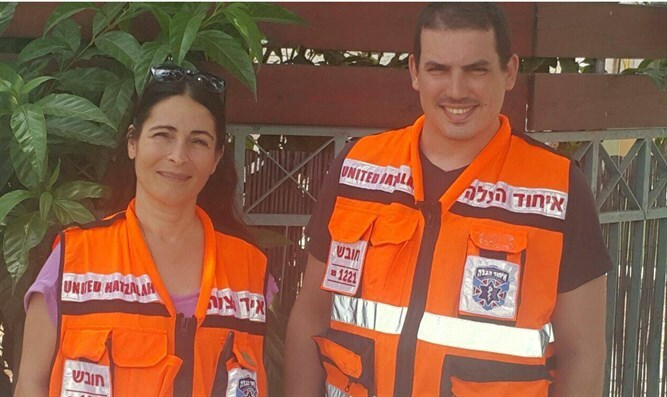 The very next day, Ayelet Telem and Eran Zriker, both graduates of the course, received an emergency alert, headed out, and delivered a baby boy. The birth took place on Thursday evening at the home of the patient. Telem and Zriker happened to be nearby, each going about their day. They both received the call, rushed to the scene and arrived in less than three minutes from the time that the dispatch center received the emergency call. Telem and Zriker saw that the woman was in the later stages of labor and when they notified dispatch they were told that the ambulance was still a few minutes away. They then prepared to help deliver the baby. Putting into practice the protocols that they learned in their recently finished course, the pair of EMT volunteers worked in tandem to prepare the woman and the environment for delivery. They assisted the woman through the difficult labor and continued caring for both her and the newly born infant boy until the ambulance arrived. At the request of the ambulance team, Telem was asked to accompany the new mother and infant to the hospital and continue to provide care in the ambulance. The mother asked to publicly thank the volunteers for their quick response and expert care, without which she would certainly have had a rougher birthing experience.